“The intuitive eating course is for everyone. We spend so much time on nutrition, what we eat, when we eat, how much we eat. We measure, limit, and shame ourselves and we are all still struggling. Food should not be the enemy, it should nourish us. What I have learned from this course is that in order to take control of the cycle we put ourselves through, you have to stop listening to everything else, and learn to listen to what your body is asking for. It is absolutely opposite of everything else out there. I feel free. I am on a better journey to my health and building a healthy relationship with food. I am free of counting calories or sticking to a strict diet. I don’t think about food as often as I use to and I enjoy it more. I highly recommend this course to everyone, Kelly is fantastic.” ~E.O. “The course is fantastic! I’m loving it. I love that I can read and journal on my own time when it is most convenient for me. All of the concepts are right on! I have become far less anxious about food. Allowing myself to eat what I want ,when I want is liberating. I no longer get that, “well I broke my diet with one cookie so I might as well eat ten more”, because this isn’t a diet! I ate one because I wanted one and now am satisfied. I highly recommend this course to anyone who wants to be free of the diet/weight obsession hell.” ~K.O. “Kelly's Intuitive Eating Course has helped me change my lifestyle when it comes to the way that I eat. To be honest, I have kind of always loved desserts and have had trouble knowing when to stop eating them! Kelly has taught me how to come up with a plan so that I can eat those but I don't need to eat them until they are gone! I found my "why" and I think that was the key to success. I want to be healthy and I also want to eat dessert sometimes. Intuitive Eating has helped me find that balance! I would recommend this course to everyone! Especially if you are looking to have an overall healthier relationship with food.” ~A.S. Learn more about Intuitive Eating! click here! Luann was not unhealthy before beginning the Jump Start program. She and her partner Jim were active, eating fairly well, and loving life traveling together. Still, Luann had begun to notice dips in her energy and her weight was beginning to creep up. She really wanted to tweak her nutrition and feel comfortable in her own skin again. She joined the six week Jump Start to Fat Loss and Health in March of 2017 and her results speak for themselves! She lost 19 pounds and over 12 inches! "I feel really good! I could have done better if I'd followed the exercise program more. Jim has also cut most of his meds in half. His high blood pressure meds and his cholesterol meds. Thanks for making us healthy! We have signed up for a 10 day Riviera Maya vacation starting April 29th. We are excited!" Congratulations Luann and Jim! You both put in the work and reaped the rewards! Have fun on your vacation! The next round of the Jump Start to Health and Fat Loss starts on May 8th! This program sells out! Click here to claim your spot! Jennifer is a busy working mom who was struggling to find balance in her life and spur weight loss. She believed she was doing everything right, but results were elusive. Jennifer knew her diet needed work and she wanted to add exercise, but didn't know where to start. She took a chance on Kelly's Jump Start program and hasn't looked back! This program has changed my life!! For the first time in probably 5 years, I have had the numbers go lower on the scale than higher!! I have learned so much. I now know how the things I have eaten have affected my body... Why, when I thought I was doing SO much right, I was actually doing SO much wrong! I was my own worst enemy! I love how I can now find time to work out in the most efficient manner. When I feel really energetic, I still enjoy a good run with my dog...but I know if I'm short on time or tired I can do some burst training or a quick Tabata. I am walking away completely satisfied and feeling healthier all the time!! Thanks again Kelly!" Are you ready to change your life and get started on the road to health and permanent weight loss? Jump into the next round of the Jump Start that begins on May 8th! What have you got to lose...except bad habits and fat? Sign up today! Joyce came to Kelly Bailey Fitness in need of help with nutrition and exercise. She underwent bariatric surgery several years prior and was successful in losing a lot of weight. Joyce was experiencing chronic back and knee pain, and life had thrown some curve balls and she had ended up regaining a significant amount of weight. She is also on medications to manage her Type 2 diabetes. Joyce works as a 911 dispatcher (a job that requires a lot of sitting), and she and her husband were eating out 4 to 7 times per week. Joyce knew her medical conditions would require careful management during exercise, so on the advice of a friend, she called Kelly. The two have been working closely through face to face training, coaching, and Joyce has also participated in two Jump Starts. Though she hasn't reached her end goal yet, she is more confident and well on her way to making sustainable changes! "I know I'm making stride forward because Kelly Bailey has been making my workouts more difficult and I can actually do them. I'm proud that I have stuck with her and myself in my training. I know I'm getting stronger and that is a wonderful feeling. I've also noticed that my back does not hurt as much as it did in the beginning when I started with Kelly Bailey. My back issues were my main reason for starting with a personal trainer. I don't regret a second of it. Thank you for all you have done for me Kelly Bailey. I've learned so much and have more confidence in myself. You're the best!" I'm so proud of and inspired by this woman....GET IT GIRL! Do you have medical conditions that need to be managed carefully during exercise? If you live close to Spencer, Ohio, consider a face to face personal training package! Let me show you what you CAN do instead of focusing on what you can't! Click here for information on personal training. Don't live close but still need help? Check out my health coaching services! I take on just a few coaching clients per year and I work closely with them to create a program of exercise and diet that fits their life and needs. This program can be administered 100% online through video conferencing! Click here for information on Health coaching. 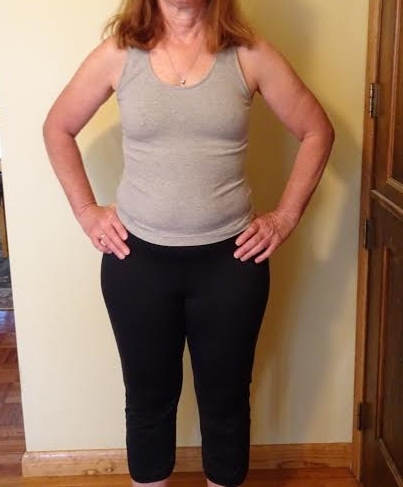 Mary has participated in three of Kelly's online programs and has lost 40 pounds! She has been able to successfully maintain her fat loss over the past 6 months. When she hits a plateau or needs some extra motivation, she simply jumps into another round of the Jump Start! She loves the support provided in the group atmosphere! "Kelly is a fantastic mentor and coach. She is an approachable, 'real' person, who understands food struggles and strives to educate and not scold. I have learned a LOT from her, and she interprets the information in a way that makes it easy to understand. Kelly goes above and beyond to make sure that everyone involved in her programs is engaged, learning, and seeing results when putting in the work. Before I started my first program with Kelly, I never thought that weight loss was possible for me. In the group setting, I not only found the motivation but also the education & tools to back it up. Thanks, Kelly, for everything!"